You read the charts right. For the state, about 25% of revenue now goes towards pensions and other debt, but that would jump to over 50% if proper amounts were being paid. For Chicago, about 34% of revenue is already being consumed by those payments but doing it right would take over 60%. The implications are catastrophic. No government can provide a reasonable level of services when it is burdened so heavily by legacy pension and other debt. That’s especially true for governments with tax burdens already as high as Illinois and Chicago’s. Similar numbers apply to many other towns and cities across the state. The charts are based on the assumption that investments set aside to pay pension obligations will earn 6% per year, which is generous. Many financial experts say a lower assumption should be used, which would make the numbers worse. 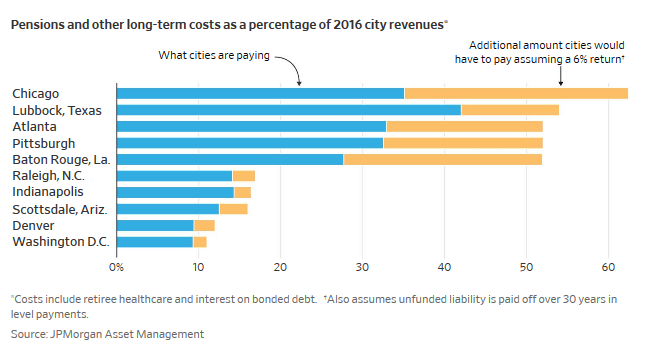 The “Costs” shown in the charts include pensions, retiree healthcare for pensioners (both of which are constitutionally protected in Illinois) and interest on bonded debt (though that interest is a very small part of the problem). The numbers for the additional amounts that should be set aside assume that unfunded liabilities would be amortized over 30 years in level payments. Here’s the central message now being blasted across the state by proponents of a $3.4 billion state income tax increase on high earners: “Illinois is in a $3.2 billion financial hole. A Fair Tax could fix that and reverse the damage.” That’s an epic lie. The “hole” isn’t $3.2 billion. It’s roughly a quarter of total revenue according to this work, which is consistent with our own numbers — about $10 billion — and that’s just at the state level. The new $3.4 billion will go down a nearly bottomless pit. Governor & Mayor don’t discuss the absolute necessity to amend the state Constitution to permit pension cuts. They’re stuck in the establishment, but they should know better. But the Tribune and Sun-Times should have articles every day on page A-1 describing the crisis, and the ONLY fix – to cut pensions quite significantly for all ppts even current retirees. It’s do or die and the clock is ticking ! But newspapers stay silent. What is the blended average expected rate of return for all the State retirement funds? I know the teachers funds expect more than 7% per year compounded. Seems high to me. 7.1% is their blended assumption. Most have beaten that in the ten-year bull run we’ve had, and many have beaten that over 40 years, including TRS. In the private sector pensions that remain, 5.5% or so is more common, which seems about right to me. (Of course, if you really wanted to guaranty it as we guaranty the pension benefits, the investments would yield under 3%). Rick you are right but on the bond side if you listen to Jeanne Ives at the City Club (youtube) the bondholders got a sweet deal put in the last minute that in the event of a municipal bankruptcy or even the implication of bankruptcy when and if that becomes legal the bondholders can get 90% of future sales tax revenue for up to 40 years until they are paid even before pensioners. This applies to home rule communities which Rockford is not. I believe Madigan sneaked this in the last minute. Could you check if this info is correct. Freddy, that’s right, and allow me to brag. As that horrible bill was moving through the legislature we at Wirepoints, and we alone, wrote about it and criticized it for what it was. See https://wirepoints.org/illinois-bill-to-prioritize-bondholders-over-the-public-and-taxpayers-must-be-stopped-wirepoints-original/ I wrote about it in Crain’s, too. We heard about it through Ives. She, waiving our articles around on the House floor, had the bill stopped. But Madigan indeed stuck it into the thousand-plus budget legislation at the end of the session and that’s how it became law. The full recap is here: https://wirepoints.org/jeanne-ives-fiery-description-of-how-chicagos-new-bond-scheme-sold-out-pensioners-and-taxpayers-quicktake/ Nobody in the regular press ever covered any of it. Wow. I never knew about this and I’m better informed than most (I think). Doesn’t this potentially also screw over the older bond holders? I wonder what the bankruptcy courts will think of this tactic? Absolutely right. The illinois media should have huge front page, lead stories daily. Each paper should run the same headline each day, “Financial Doom Statewide in Illinois”. Can you throw in a 20 year historical chart for this metric? The situation is already pretty dire — that is obvious. But I would be interested to see how fast it is accelerating, as well as how fast it accelerated in 2008/2009. 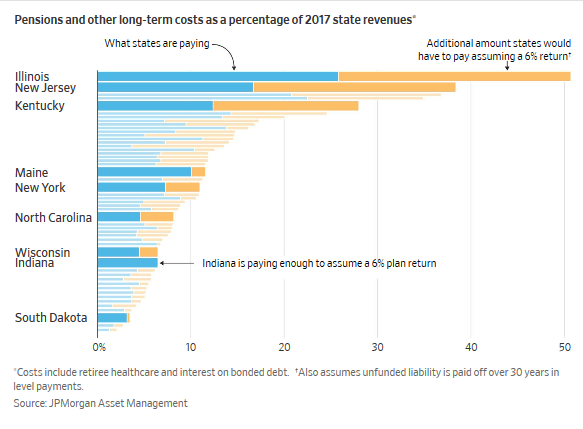 Hank, take a look at the last graphic in this piece: https://wirepoints.org/illinois-state-pensions-overpromised-not-underfunded-wirepoints-special-report/. There you’ll see what pensions have consumed of Illinois’ budget since 1996. You’ll see things get worse over time. But mind you, these are based on the official numbers, which mean the required amortization of the pension debt is much smaller than the truly required one…Hope it helps. Thanks guys. I was just wondering if there was a way to accurately project when we hit 100% of rev, or when future cash flow strains become critical. The 100% or revenue thing is not really important because we aren’t actually paying it all, just running it up as debt. But your second question about cash flow is the big one. It’s an eternal one — when does an insolvency crisis convert to a cash flow crisis? My view is that’s hard to predict, but the next recession could be it. Great article, Mark. Thank you for keeping up the pressure. Sunshine is always the best disinfectant.